While the boats headed south, some head along the coast to destroy the homestead of his enemy at Holderness. This panel shows an English scout watching the Norse force from up a tree. The invasion was expected and most of the troops would have been gathered to support their thegns and the Earl of Northumbria, Morcar. It was vital that Morcar knew what the invaders planned. Should they come out to meet the invaders or wait for Harald to come to them? 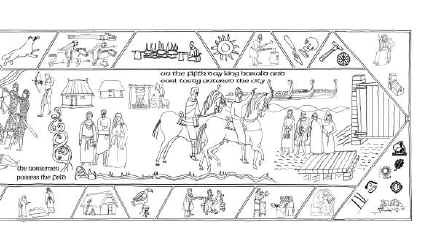 The figures in this panel are all derived from the Bayeux Tapestry. The trees are not in the least natural but they embody a style common in Celtic and, to some extent, Norse interlaced or woven art. All embroidery of this period adopts the same ‘skeletal’ representation of trees. Trees of this type decorated the margin of many surviving religious books. Perhaps they had become used as symbolic representation of trees. It certainly makes it much easier to incorporate the young lookout who is seen perched on the tree. Beyond the trees lies a building which has pillars, a tiled roof and arched doors, plus windows. It is in flames. This represents a fine building which was the target of Tostig’s vengeful raid. While the hall at Holderness burns, messengers gallop away to report on the attacking force. The location of the hall at Holderness is unknown. The narrative progresses across the panel with two English housecarls galloping away with news of the attack. They are not running away from the fight but have been able to work out what the invaders planned. Were the Norsemen going to ravage the land and make their way gradually towards York? Were they going to establish a strongpoint in Holderness that they could defend? The messengers are galloping to tell Morcar that the longships are now in the Humber and so it was clear that they planned to come inland. The figure on the left is an unarmed figure being killed. This figure appears in the Bayeux and is thought to represent as the just punishment of England for their treachery in resisting William from the Normans perspective. There are parallels in early copies of the bible illustrating the execution of Nebuchadnezzar’s sons and this figure is thought to be associating the image with that event. In this context, Earl Tostig is taking his revenge for the coup that led to his exile. The image expresses an element of punishment of those who took part in the coup against him. The only defenders are some poor farmers who have no swords or armour. There would be little they could do against such a force. However, their action could delay the attackers long enough for a mother to lead her son away. He is clutching a book, possibly rescued from a church. The images all derive from the Bayeux Tapestry. Not everybody decides to stand and fight. The flight is led by the old men who have the household valuables in their purses and are accompanied by their hawk, and house-dogs. These rather comic figures would have been the bailiff and pantler from the hall and indicate that there was a wealthy and important lord in the area. None of the fleeing figures are in a great rush, indicating that the invaders are intent upon destroying the symbols rather then the people. King Harald of Norway probably intended to make his stay a long one. When York surrendered after the battle at Fulford, part of the agreement was that the citizens should join him in the conquest of England. Earl Tostig definitely planned to stay so it was not sensible to destroy the people he hoped soon to rule. The symbolism of the fox making off with the chicken needs little explanation. However it does associate King Harald with the cunning of the fox and this will be a theme developed during the battle. This icon is telling us that the fox is getting a feed now and one should be aware that the fox had many ways of getting what it wanted. Juxtaposed with the fox is the Bayeux representation of a lion. However, this lion has his tail between its legs. The lion is representing the English who are held at bay for the moment. The boy with the bells is sounding an alarm. All the images derive from the Bayeux Tapestry. The agricultural and spiritual activities of this fertile area are shown. The message is that this is a rich area, some of whose wealth was devoted to the church. The implication is that the invaders are greedy for the riches but not deserving of the support of higher authority. The abbess in the centre expresses her horror at what she sees.